1. Dumbo Tsum Tsum. I absolutely LOVE Disney Tsum Tsum’s and I really want to start collecting them (I’ve been saying that for months now!) Right now I only have three (mini Stitch, mini Donald and medium Mickey) but I’ve hinted to my friends and family to get me some for Valentine’s Day so here’s hoping! 2. ‘On the Go’ Notebook Set. It wouldn’t be a Monthly Must Have list without Rifle Paper Co. Seriously, my desk drawers are filled with Rifle Paper Co. products! I really want to add this adorable notebook set to my collection. 3. The Art of Disney Notecard Set. It’s so secret that I LOVE Disney (and notecards!) I NEED this adorable ModCloth notecard set in my life! I would love to frame some of these notecards and decorate my bedside table with them! 4. Peter Pan Glasses Case. I’m ‘supposed’ to wear glasses but I never do (I see fine without them but if something is SUPER far away, it can be a little blurry.) I was recently contacted by Firmoo to review a pair of their ADORABLE glasses (it was so hard picking just one) so of course I need a glasses case now (especially since I’ll mostly be keeping my glasses in the case since I don’t really ‘need’ them.) Peter Pan is one of my favorite classic Disney films so this case would be perfect for me! 5. Alarm Clock. Ever since I got my iPhone 6 early last month, my alarm has been annoying the crap out of me! Some days it goes off fine and other (most) days it doesn’t go off at all. I guess it’s time to invest in an old fashion clock because I can’t afford to be late. Can you believe it’s February already? 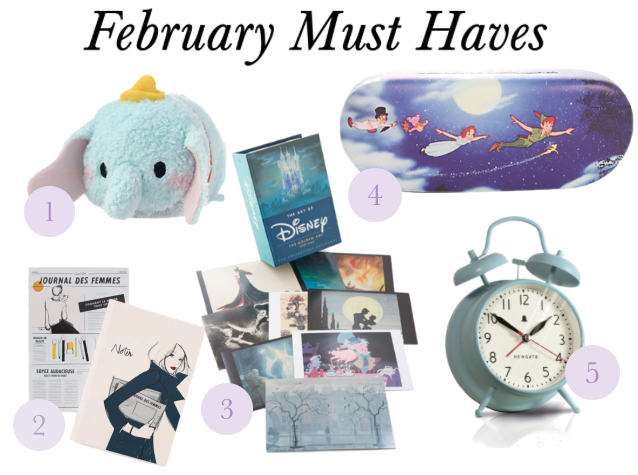 What’s on your must have list this month?